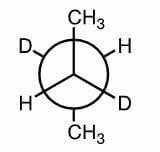 Which statement best describes the conformation of the following molecule? A. Most stable, staggered, and gauche. B. Least stable, eclipsed, and syn. C. Most stable, eclipsed, and syn. D. Least stable, staggered, and anti. E. Most stable, staggered, and anti. This is a Newman projection looking down from C2 to C3 in this deuterated butane. The two bulkiest substituent groups are the methyl groups. In this conformation, the methyl groups are 180 degrees from each other which is designated ANTI, causing the least amount of steric strain possible. Additionally, all groups are staggered (AKA not on top of each other or eclipsed). Therefore, this is the most stable conformation, since it is staggered and anti.